Join the USGBC-Missouri Gateway Chapter’s Emerging Professionals for a tour of EarthDance Farm, the oldest organic farm west of the Mississippi. 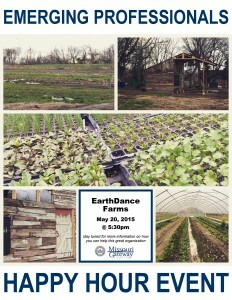 EarthDance sustainably grows food, farmers, and community through hands-on education and delicious experiences. Complimentary beer generously provided by Ferguson Brewing Company! 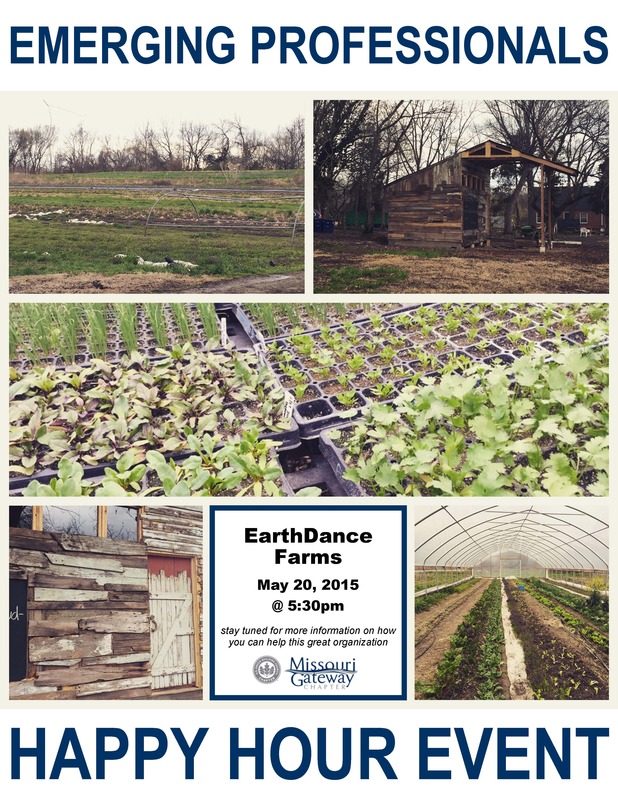 EarthDance Farm, 233 S. Dade Avenue, Ferguson, MO 63135 (map). Interested in carpooling to EarthDance from the USGBC-Missouri Gateway Chapter Office or from Downtown St. Louis? Register online via the link below for more information. 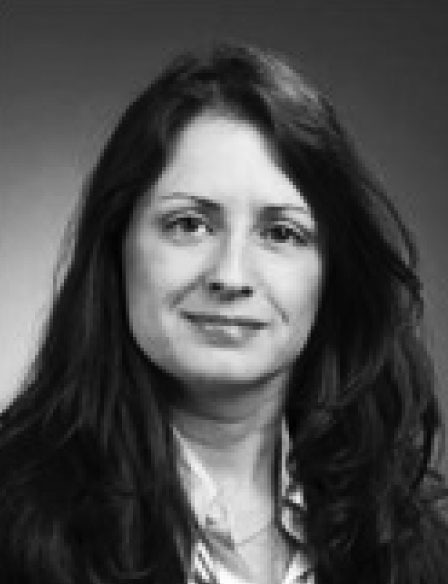 Christine VanLeeuwen, LC, an LED lighting specialist, was quoted in “How to Brighten Your Bottom Line” in the April 2015 issue of Paint & Decorating Retailer magazine. Energy demands, specifically lighting, are intense in retail environments. The article discusses how lighting upgrades reduce energy consumption, lower operating expense, and draw more customers into stores, all leading to higher profits. The article can be viewed in full on the Paint & Decorating Retailer Magazine website, and you can learn more about Christine in her Chapter member profile. Explore the USGBC-Missouri Gateway Chapter online member directory to learn more about all of our members! Join the USGBC-Missouri Gateway Chapter for two upcoming in-person events featuring Joyce Lee: “Healthy Cities + Policy Implications” on May 12 and “Green Design + Human Health + Social Equity” on May 13! “Health is a state of complete physical mental and social well-beig and not merely the absence of disease or infirmity,” according to the World Health Organization. Healthy cities – what comes to your mind? Fresh air, citizens walking, bicycling or jogging, smiling faces, just to name a few. This article discusses why a comprehensive approach is needed and delineates a selection of examples around the country that could serve as inspiration for other communities. How is the country responding? One of the latest small city competitions is called HICCup for Health Initiative Coordinating Council. A well-known tech investor, Esther Dyson, has started a grand experiment to enlist small cities in a friendly challenge to help communities become healthier places inhabited by healthier residents. Selected from 42 contestants, five small cities or counties—each with a population of 100,000 or less—are taking part in “The Way to Wellville.” They are Muskegon, Michigan; Lake County, California; Spartanburg, South Carolina; Clatsop County, Oregon; and Niagara Falls, New York. In addition to existing community partnerships, Ms. Dyson launched an investor mindset to health promotion. “The Wellville Challenge fits perfectly into the work of greater Muskegon, to achieve the ‘1 in 21’ goal, led by the Muskegon Health Department and the Rotary Club, to become the healthiest county in Michigan by 2021. It also amplifies our health mission at United Way,” says Christine Robere, President and CEO of United Way of the Lakeshore. As health is a core component of thriving communities, the Urban Land Institute (ULI) Building Healthy Places Initiative is building on work that links human health and development. Auto-dependent roadways have long been an area of health concern. With support from the Robert Wood Johnson Foundation, ULI is investigating best practices to reinvent under-performing suburban and urban arterials in health-promoting ways. The Food Trust, based in Center City of Philadelphia, ranked #2 “high-impact” nonprofit in America in children’s health and nutrition. In its two decades’ history, the Food Trust has worked with neighborhoods, schools, grocers, farmers and policymakers in Philadelphia and across the country to change how Americans think about healthy food and increase its availability. With partners, the Trust brought supermarkets to communities in food desserts, helped corner store introduce fresh produce, low-fat dairy and whole grains, introduced healthier food options in schools. A recent study by the Philadelphia Department of Public Health found that – for the first time in decades – the obesity rates among Philadelphia school children decreased by 5 percent between 2006 and 2010. The healthcare cost savings can be significant when the years of care are reduced dramatically. Policy interests could be ignited in many ways. 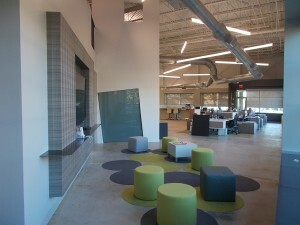 Designers as a non-traditional health partner create new alliances or invigorate existing ones. Stair Week is a program that brings together the health officers and the built environment sectors to focus on physical activity and good design. As Americans spend more than 90% of waking hours indoors, good stair design motivates students, employees, retirees alike. And while it seems like a small change, taking the stairs routinely can have a big impact on health. The Stair Week proclamations received from governors in Illinois, Maryland, and Michigan are an affirmation of these smart choices. “We know ‘place matters’. Design and health is a strong emerging issue at the American Institute of Architects (AIA) and their sustainability priorities. It’s a great topic for local advocacy where architects can make a big difference in health outcomes,” said Mary Ann Lazarus from St. Louis, AIA Resident Fellow. Join the USGBC-Missouri Gateway Chapter for two in-person events featuring Joyce Lee: “Healthy Cities + Policy Implications” on May 12 and “Green Design + Human Health + Social Equity” on May 13. The U.S. Green Building Council – Missouri Gateway Chapter invites new members to come socialize and get acquainted with the Chapter! Chapter officers, past and present, will be on hand to share the chapter’s history, highlight member benefits & opportunities, and answer questions. After new members have learned about the Chapter, they will tour Gray Design Group’s LEED for Commercial Interiors Silver Certified space, and learn about the sustainable design, construction, and operation features that contributed to the space’s certification. RSVP: Online registration is now closed. Attendees may register in person at the event. National Volunteer Week – Thank you to our Volunteers! It’s National Volunteer Week, and the USGBC-Missouri Gateway Chapter leadership and staff offer their appreciation to all Chapter volunteers! Whether our volunteers serve on a standing committee, mentor a school participating in the Green Schools Quest, make presentations on the Chapter’s behalf, assist non-profits complete LEED Documentation through the LEED Community Project, support congregations to green their building operations, or lead the Chapter on our Board of Directors, the service of our volunteers is critical to our work to transform the built environment! The USGBC-Missouri Gateway is committed to recognizing volunteers who contribute significantly to the Chapter, devoting time and talents “above and beyond” on a particular project or program. This week, in honor of national volunteer week, we were pleased to recognize several volunteers! 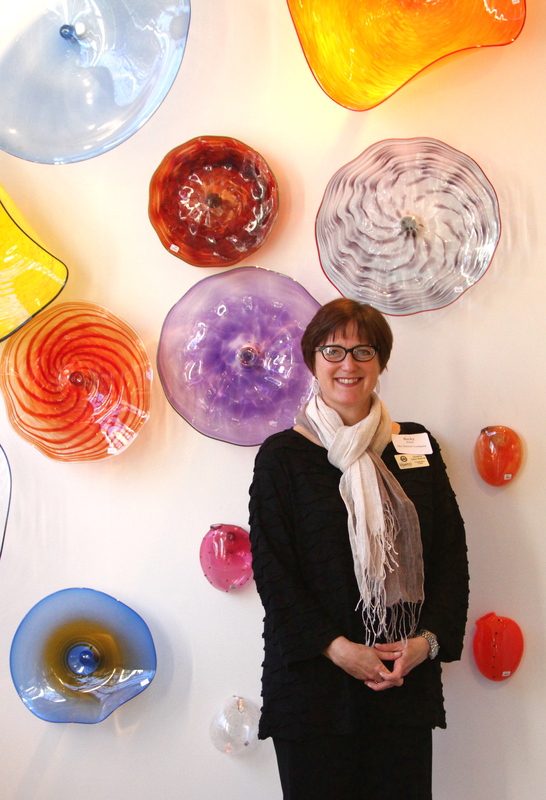 You can read about previously recognized Above + Beyond Volunteers here. The USGBC-Missouri Gateway is committed to recognizing volunteers who contribute significantly to the Chapter, devoting time and talents “above and beyond” on a particular project or program. We are happy to recognize Becky Finch of TriNet for her service to make the 2015 Growing Green Spotlight Celebration a success! 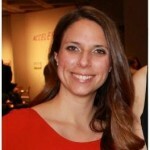 Becky was nominated by Jen Kissinger of Paric Corporation, past co-chair of the Growing Green Awards Working Group and At Large member of the USGBC-MGC Board of Directors, for her leadership of the Growing Green Awards Working Group. This year the Working Group mixed things up, getting creative with the 7th annual celebration of the people and organizations transforming the built environment. They decided to highlight the accomplishments of the past 6 years of winners in a refreshed event- the Growing Green Spotlight! Attendees learned about all that past winners have accomplished since their award through poster displays and fast-paced presentations. The success of the event was made possible by Becky and her fellow event volunteers, who coordinated the evening’s venue, catering, promotion and logistics. Feedback about the new event format was overwhelmingly positive. Many thanks to Becky for her hard work and dedication! Announcing the Winners of the 2014-2015 Green Schools Quest! 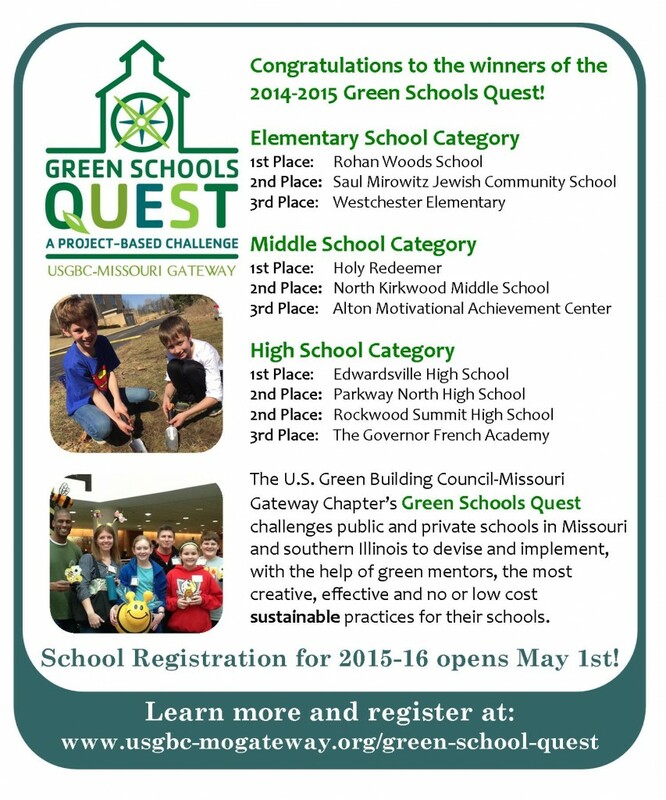 Congratulations to the winners of the 2014-2015 Green Schools Quest! The Green Schools Quest challenges public and private schools in Missouri and southern Illinois to devise and implement, with the help of green mentors, the most creative, effective and no or low cost sustainable practices for their schools. Kudos to all 38 participants! Interested in learning more about what each Green Team achieved? A summary of each school’s submission is available on our website here. Several schools submitted digital presentations and videos on Youtube. Click here to view a playlist of those videos. School and mentor registration for the 2015-2016 Green Schools Quest opens May 1st! Visit the Green Schools Quest page for more information. The USGBC-Missouri Gateway is committed to recognizing volunteers who contribute significantly to the Chapter, devoting time and talents “above and beyond” on a particular project or program. We are happy to recognize the volunteers responsible for the 8th Annual Green Schools Event for their service to make this event a success. These volunteers were nominated by Katie Belisle-Iffrig of Code Green Collaborative, chair of the USGBC-Missouri Gateway Chapter Green Schools Committee. 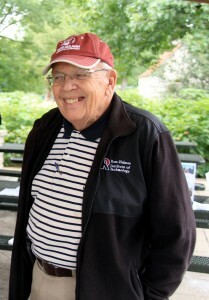 Volunteers collaborated in numerous ways to make this event a success. Jim Biggs of the EarthWays Center of the Missouri Botanical Garden, Lesli Moylan, Kim Petzing of Madison County Government, and Ralph Bicknese of Hellmuth + Bicknese Architects coordinated and facilitated the Teacher’s Roundtable that preceded the event. Kathleen Engel of Ameren Missouri Pure Power coordinated tours of the Project IDEA space, and Ralph Bicknese of Hellmuth + Bicknese Architects, Tyler Loucky of St. Louis Composting, Ed Choklek of FGM Architects, and Michele Dow of Dow Environmental Protection staffed the registration and Green Schools tables. The event was emceed by Cindy Bambini of Brightergy. Many thanks to Jim, Lesli, Kim, Ralph, Kathleen, Tyler, Ed, Michele and Cindy for their service! The USGBC-Missouri Gateway is committed to recognizing volunteers who contribute significantly to the Chapter, devoting time and talents “above and beyond” on a particular project or program. We are happy to recognize Franklin Eppert of AFRAM Corp. for his service on the Technical Committee, Green Schools Quest, and LEED Community Project. Frank was nominated by Caryl Kinsey- Fox, past chair of the USGBC- Missouri Gateway Chapter Technical Committee, for his attention to detail, extensive technical knowledge, and years of service. In addition to his work with the Technical Committee, Frank served on the Energy & Atmosphere Team for the 2014 LEED Community Project, working to complete LEED documentation for the Dennis & Judith Jones Visitor & Education Center in Forest Park. Frank served as a Green Schools Quest Mentor to students at Little Flower School, supporting students as they created a garden on school grounds and as they benchmarked their school’s energy use. Frank also presented to 60 of Cardinal Ritter’s Foster Grandparents about the Green Schools Quest, and participated in the Green Your House of Worship Workshop, supporting congregations as they began to create a sustainability plan. Many thanks to Frank for his leadership and hard work! The USGBC-Missouri Gateway is committed to recognizing volunteers who contribute significantly to the Chapter, devoting time and talents “above and beyond” on a particular project or program. We are happy to recognize Carolyn Gaidis of LAND SYSTEMS for her years of service as chair of the Scholarship Working Group. 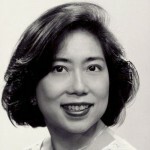 Carolyn was nominated by Christy Cunningham, at large member of the Board of Directors, and George Fujii, chair elect of the Board of Directors, for her tireless work to make the ECORIDE fundraiser and Scholarship Working Group successful. The funds raised from the 2012, 2013, and 2014 ECORIDEs allowed 9 individuals to attend Greenbuild, attend Greening the Heartland, or sit for the LEED Green Associate exam. Carolyn also serves as the Vice President of Events for the St. Louis Chapter of the American Society of Landscape Architects. Many thanks to Carolyn for her leadership and hard work!